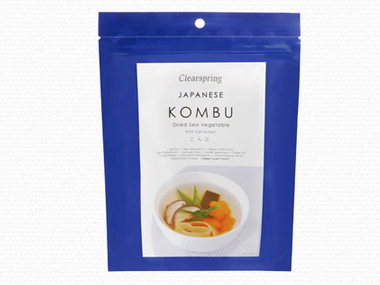 Order Clearspring Japanese Kombu from the Online Health Food Store UK. Buy Clearspring Japanese kombu 50g and other quality Seaweeds safely online in the UK. Soak and cook for 20-30 minutes to make 'dashi'. If you want to automatically receive an email when 'Japanese Kombu' is back in stock, just leave your email address below. Thick, wide strips of Kombu are commonly used to flavour Japanese soups, noodle broths and stocks (dashi). Kombu contains natural glutamic acid - an umami-providing amino acid - that draws out the taste of other foods. To prepare a basic stock, add one piece of kombu to a litre of water and bring to a simmer. If the kombu is soaked in the water for an hour first it will become tender enough after simmering to slice, season and add to vegetable dishes. A strip of kombu cooked with beans helps to soften them and improve digestibility. Kombu contains a wide range of minerals and is especially rich in iodine. Clearspring Kombu is Laminaria japonica, sustainably wild harvested and dried in Japan. As official Clearspring stockist in the UK, we sell quality Seaweeds to customers throughout the UK in England, Wales, Scotland and Northern-Ireland. Where to buy Clearspring Japanese Kombu safely online? Shop at the Online Health Food Store if you are wondering where you can buy Clearspring Japanese kombu 50g safely online in the United Kingdom. Our Health Shop is located in the UK and our award-winning independent has been serving customers in England, Wales, Scotland and Northern-Ireland since 1976. You can buy our Organic food and other quality Seaweeds online and we post out orders to any UK address. Japanese Kombu - Clearspring Japanese kombu 50g in Seaweeds and Foods.